This pigeon van is built to the same design as our restored example 4050. Similarly built at York in 1941 there was one significant difference. By the time 70442 was built (originally numbered 4069) the war was forcing economies so it emerged with steel panelling rather than teak. However the LNER promptly set about painting it to match the teak stock; using a scrumbled paintwork complete with full lining to make it look like wooden panelling! (a small proportion of this remains visible on the body side today. It ran in BR service until 1970, when it was preserved by the Worth Valley Railway. Sold on to an RVP member at Chappel it was used for stores there until 1999. 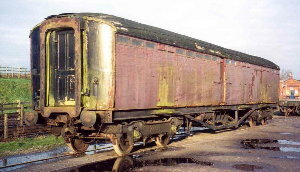 By then in very poor condition, it was donated to RVP initially intended as a source of spares.